Climate controlled, driver/passenger security window, sun roof, seats up to 4 people. 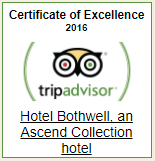 Only at Hotel Bothwell. Watch for updates to our website for special packages. Also, check out our facebook page for pictures of our “new” toy! We’re so excited to have it available!! !